Save an extra CDN$ 11.26 (38%). Buy the Kindle Edition instead. For gardeners, inspiration can come from the most unexpected places. Perennial enthusiasts around the world might be surprised to find their muse in the middle of a bustling city. Lurie Garden, a nearly three-acre botanic garden in the center of Chicago’s lakefront in Millennium Park, is a veritable living lab of prairie perennials, with a rich array of plant life that both fascinates and educates as it grows, flowers, and dies back throughout the year. Thousands of visitors pass through each year, and many leave wondering how they might bring some of the magic of Lurie to their own home gardens. With Gardening with Perennials horticulturalist and garden writer Noel Kingsbury brings a global perspective to the Lurie oasis through a wonderful introduction to the world of perennial gardening. He shows how perennials have much to offer home gardeners, from sustainability—perennials require less water than their annual counterparts—to continuity, as perennials’ longevity makes them a dependable staple. Kingsbury also explains why Lurie is a perfect case study for gardeners of all locales. The plants represented in this urban oasis were chosen specifically for reliability and longevity. The majority will thrive on a wide range of soils and across a wide climatic range. These plants also can thrive with minimal irrigation, and without fertilizers or chemical control of pests and diseases. Including a special emphasis on plants that flourish in sun, and featuring many species native to the Midwest region, Gardening with Perennials will inspire gardeners around the world to try Chicago-style sustainable gardening. Start reading Gardening with Perennials on your Kindle in under a minute. "Gardening with Perennials, by the British garden writer Noel Kingsbury, muscles its way in, dispensing 'lessons from Chicago’s Lurie Garden.' It will be indispensable for Midwestern gardeners who deal with searing heat and bone-rattling cold—and not much in between. Yes, an Englishman in Chicago. That’s the twist that makes this book special: It took an out-of-towner to realize that the dazzling, gently rolling five-acre Lurie Garden in Millennium Park merited book-length attention. . . . brimming with ideas for every home garden." "Over the years perennial gardening has become a collection of yearly, new-fashioned plants overwhelmed by wood mulch and often replanted every few seasons as the plants decline and die. Plantsman and international garden designer Piet Oudolf created a perennial planting Lurie Garden located in Millennium Park in Chicago that lives engaged in its own well-being and abundant in moment to moment beauty through all four seasons. The planting isn’t theoretical but practice based, creating the possibilities for all future perennial plantings. Noel’s book welcomes you into the health and joy of contemporary perennial gardening." Noel Kingsbury is a best-selling horticulturalist and writer. He is the author of many books, including Designing with Plants, Natural Gardening in Small Spaces, and Gardening with Perennials: Lessons from Chicago's Lurie Garden, as well as the coeditor of Vista: The Culture and Politics of Gardens. He lives and gardens in western England near the world-famous book town of Hay-on-Wye. 2.0 out of 5 starsbetter books out there. 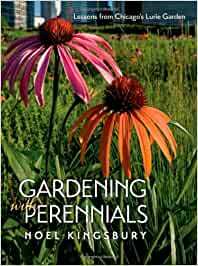 If you are buying this as a how to book to maintain a perennial garden, you are better off buying Tracy Disabato-Aust book . Noel Kingsbury is a very prolific garden writer but he does not do much gardening himself, thus the advice in this book is somewhat misleading. For instance, his advice on watering is essentially the opposite of what is done at the Lurie. Although drip irrigation is fine strategy a true sustainable practice just waters when needed (because producing all that drip tubing also uses natural resources). If you are buying this because you wanted to hear about the lessons from the Lurie Garden, then you are better off buying Roy Diblik's book. Diblik grew plants for the Lurie Gardens and knows exactly what goes on on the ground. . Kingsbury does mention the Lurie garden here and there but the book is not a compendium of lessons learned from Lurie Gardens as the title implies. To me it is not clear what was the goal here. It is vague and incomplete about gardening with perennials, and not mainly focused at Lurie. I am an experienced gardener and have read many gardening books. This book was very interesting for it's different perspective on plantings, and the usage of plants suggested in the detailed plant listing in the last chapter.